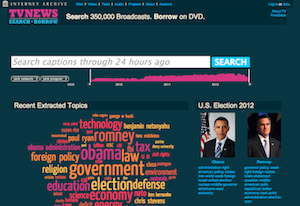 Today the Internet Archive launches TV News Search & Borrow. 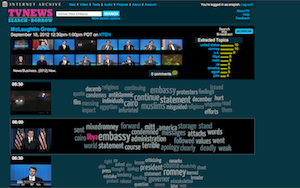 This service is designed to help engaged citizens better understand the issues and candidates in the 2012 U.S. elections by allowing them to search closed captioning transcripts to borrow relevant television news programs. The Internet Archive works to preserve the published works of humankind. Inspired by Vanderbilt University’s Television News Archive project, the Internet Archive collects and preserves television news. 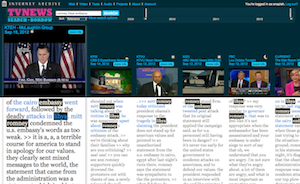 Like library collections of books and newspapers, this accessible archive of TV news enables anyone to reference and compare statements from this influential medium. The collection now contains 350,000 news programs collected over 3 years from national U.S. networks and stations in San Francisco and Washington D.C. The archive is updated with new broadcasts 24 hours after they are aired. Older materials are also being added. Use the index of searchable text and short, streamed clips to find programs to borrow on DVD-ROM or view at the Internet Archive’s library in San Francisco. Will I be able to use the news materials in my online documentaries? Seems only for English, no other languages?